A sump pump is part of a building's foundation drainage system. It discharges water from the weeping tile to the drainage swales or directly to the on-site stormwater service. If the sump pump discharges to the ground, it's important to provide a splash pad or a flexible hose at the discharge point. This minimizes soil erosion at the foundation wall and prevents recirculation of water back to the weeping tile. Direct the flexible hose or splash pad to a drainage swale, not onto adjacent properties. Disconnect the sump pump discharge hose during winter to prevent it from freezing. Since 2006, developments involving single detached, semi-detached or duplex houses must provide foundation drain discharge collection systems. 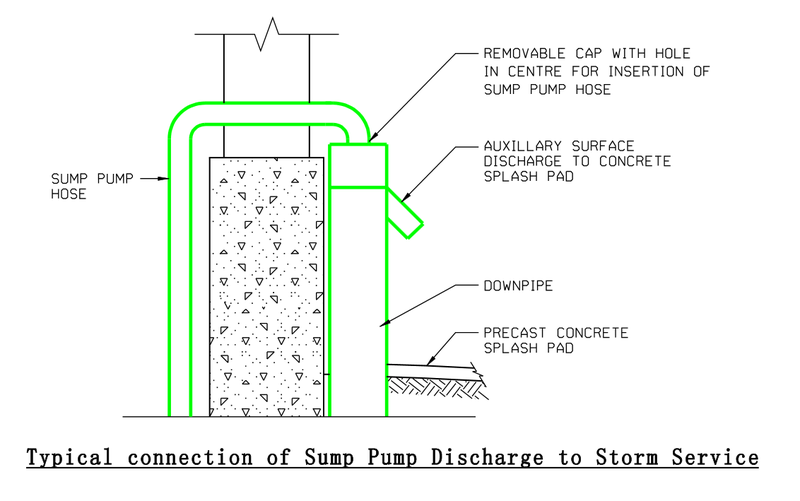 These properties must connect the sump pump discharge outlet to the foundation service.